Neodymium magnets come in different grades such as N42, N52 or N42SH. What do these numbers mean? How does the grade relate to the strength of a magnet? Does a magnet have a Gauss number? A magnet grade is a good measure of the strength of a magnet. In general, higher numbers indicate a stronger magnet. The number comes from an actual material property, the Maximum Energy Product of the magnet material, expressed in MGOe (Mega Gauss Oersteds). It represents the strongest point on the magnet’s Demagnetization Curve, or BH Curve. The pull force from a magnet varies with the grade or N number. Double the N number and you’ll find roughly double the pull force. How do you measure the strength of a magnet? It depends on what is meant by strength. Two common measures of a magnet’s strength are the pull force and the strength of the magnetic field. Pull force is how much force you have to pull on a magnet to move it away from something, such as a steel surface or another magnet. We show this force in pounds on our site, though you could also express it in Newtons, or even kilograms. The specific way the magnet is tested can have a huge influence on the measured strength. We show several different measures of strength, as described in our Pull Force FAQ answer. The number we use most is Pull Force, Case 1. It is the force required to pull a magnet directly away from a steel surface. It is a great reference for magnet strength, expressed as a single number. Even if your application doesn’t pull on the magnet in the same way, this is often a good number to use to compare the strength of different magnets. Interestingly, the pull force between two magnets that are touching (which we call Case 3 in our online calculators) is equal to Pull Force, Case 1. The magnetic field strength is a measurement of the magnetic field’s strength and direction at a particular point near the magnet. It is expressed in Gauss or Tesla (1 Tesla = 10,000 Gauss). It depends on the size, shape and grade of the magnet, where the measurement is performed, and the presence of any other magnets or ferromagnetic materials nearby. Our Surface Fields article is a good place to learn more about this. This is the important number when using magnets to activate a reed switch or Hall effect sensor. What Grade Should I Choose? It depends on the application. If you need the highest strength in the smallest possible package at room temperature, grade N52 is the strongest available. Many of our magnets are offered in grade N42, which is a great balance between cost, strength and performance at higher operating temperatures. You can get the same strength as an N52 magnet by using a slightly larger N42 magnet. If you have slightly elevated temperatures, in the 140°F to 176°F range (60°C -80°C), N42 magnets might actually be stronger than N52. This is especially true if your magnet shape is very thin. See our detailed article on Temperature and Neodymium Magnets for more details. For even higher temperatures, consider some of our High Temp Magnets, offered in the N42SH grade. For a complete list of available grades, see our Specs page. How many Gauss is a magnet? We’re often asked if a magnet “has 10,000 Gauss.” This is a bit of a strange question, since Gauss is a unit of magnetism that can apply to different measurements or magnet properties. A magnet doesn't have one specific amount of Gauss in it. Two common measurements expressed in Gauss are The Residual Flux Density, Br, and the Surface Field. Residual Flux Density, Br, is the magnetic induction remaining in a saturated magnetic material after the magnetizing field has been removed. Scroll down to the last section of this article for a more detailed explanation. This number is a material property which is independent of the magnet shape. Grade N42 magnets have a Br of 13,200 Gauss, while N52 magnets can be as high as 14,800 Gauss. See our Specs page for more Br values for various neodymium magnet grades. The Surface Field is the strength of the magnetic field measured right at the surface of the magnet. It’s the field strength you might measure if you could squish a magnetometer’s sensor right up against the surface. This number depends on the magnet material, the shape of the magnet and how it’s used in a magnetic circuit. How Do Neodymium Magnet Grades Compare to Other Magnet Types? Neodymium magnets are by far the strongest type of permanent magnet available. Magnet advancements are a history of increasing coercivity. Neodymium magnets are both stronger and less apt to be demagnetized than other magnet types. Where do these N numbers come from? The performance of a magnet material is defined by that material’s hysteresis curve, also known as a Demagnetization Curve or BH Curve. The Maximum Energy Product is the point on this curve where the B value multiplied by the H value is at its maximum. At a point on the curve, multiply the "B" value (in kilo Gauss) by the "H" value (in kilo Oersted) to get the Maximum Energy Product (in Mega Gauss Oersted, or MGOe). 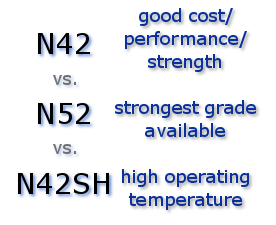 For example, grade N42 has a Max Energy Product of 42 MGOe. Magnets with a bigger Maximum Energy Product will have greater strength. Specifically, the shape of the BH Curve indicates both how strong a magnet is and how strong of a magnetic field you would need to demagnetize the magnet. A BH Curve describes the magnetic properties of the magnetic material. Let’s examine one step by step. Consider a neodymium magnet sitting inside a magnetizer. The magnetizer is essentially a coil of wire wrapped around the magnet, through which we will apply a very strong current to create a magnetic field. In the graph at right, the horizontal axis shows the strength of the Applied magnetic field (H) – the one we get by running current through the wire. The vertical axis shows the Induced field (B), which the permanent magnet creates by itself. around the magnet, through which we will apply a very strong current to create a magnetic field. The magnet we will start with has just been manufactured, but not yet magnetized. The magnetic field it creates is zero (B). There is no current running through the wire, so the applied field (H) is also zero. Let’s represent this point with a dot at the zero location on the graph, point #1. Now, let’s briefly run a terrifically strong current through the wire, placing the magnet in a uniform magnetic field. Keep increasing the current, and the applied field increases. 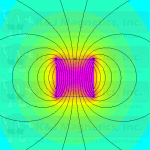 If we measure the magnetic field, we also see an induced magnetic field, made from the magnet. At point #2, the increases level off. At point #2, we still have a current running through the wire producing an Applied field, plus an Induced field from the magnet. Now, let’s turn the current off. The Applied field (H) drops to zero, but there remains a magnetic field produced by the magnet, shown as point #3. This point is also called Br, Br max, the Residual Induction or the Residual Flux Density. In our Glossary, we define Br as, “the magnetic induction remaining in a saturated magnetic material after the magnetizing field has been removed.” That's at point #3. If we apply a current in the opposite direction, the magnetic field created by the current in the coil of wire opposes the field from the magnet -- it is in the opposite direction. By applying progressively more current in this direction, we can find the shape of the normal curve in the second quadrant (the upper left hand quarter) of the BH Curve graph. Where the Induced field reaches zero, at point #4, is called the Coercive force, Hc. This is the magnet's Coercivity: the measure of the magnet’s resistance to demagnetization by an external magnetic field. The farther left on the graph this point is located, the stronger the magnetic field you need to demagnetize the magnet. Not only are neodymium magnets strong, but they have the highest coercivity values of all permanent magnet types. The rest of the graph follows a symmetric form. 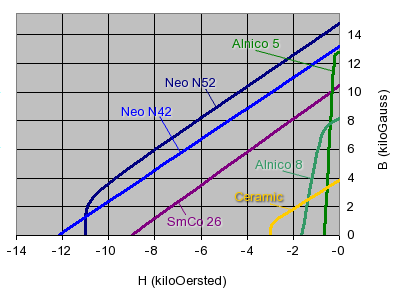 The whole shape of this graph is the hysteresis curve, and defines how a particular magnet material behaves. It is a property of the magnet material. When considering the performance of an already magnetized magnet in an application, we only need to look at the 2nd quadrant (the upper left quarter of the graph) to see how it will behave. The shape of the curve shows how the magnet works in actual applications. The actual operating point on the graph depends on the shape of the magnet and how it is used in a magnetic circuit (its Permeance Coefficient). For some examples of how to use this information and to find the actual operating point on this curve, see our article on Temperature and Neodymium Magnets.